Playing in the (recycled) mulch! Customer Appreciation Days are Soon! Planting a tree is always a good thing. They produce oxygen, can revitalize urban areas, and provide a sense of calm and beauty to every passerby. Often, tree planting comes with a little landscaping, either to “frame” the tree where it stands or to support it. And, while most of these landscaping techniques are harmless, there’s one that can actually do a lot of damage: Volcanoes. The volcanoes are made of mulch instead of lava. “Volcano mulching” is the all-too-common practice of piling mulch in an inverted cone up the trunk of a tree. Drive anywhere in suburbia and you’ll see mulch volcanos — along parkways, in yards and in gardens. The intention may be good, but the practice is harmful to trees. Mulching, when done correctly, offers many benefits to trees. Mulch mimics nature by creating a layer of organic material under the spread of a tree. In the woods, fallen leaves, branches and herbaceous plants cover the ground. This organic matter is called leaf litter — but it’s a good kind of litter! It retains moisture, insulates the ground, slowly decomposes, and enriches the soil. There’s an entire ecological system in leaf litter, complete with food webs, unique biochemistry, and micro-climates. In landscaped settings, the ground under a tree may be a thin layer of turf grass or bare soil. Mulch is added as a ground cover to achieve some of the benefits that natural leaf litter provides in the woods. It helps to hold moisture, suppress weeds, and insulate the soil from extreme heat and cold. It also protects trees and shrubs from overly zealous gardeners with lawns mowers and weed whips. Often, mulch is used purely for aesthetics. People just like how mulch looks. It gives a neat and tidy appearance to landscaping. The problem is that volcano mulching takes the benefits of mulching and turns them into negatives. Water retention is a prime example. 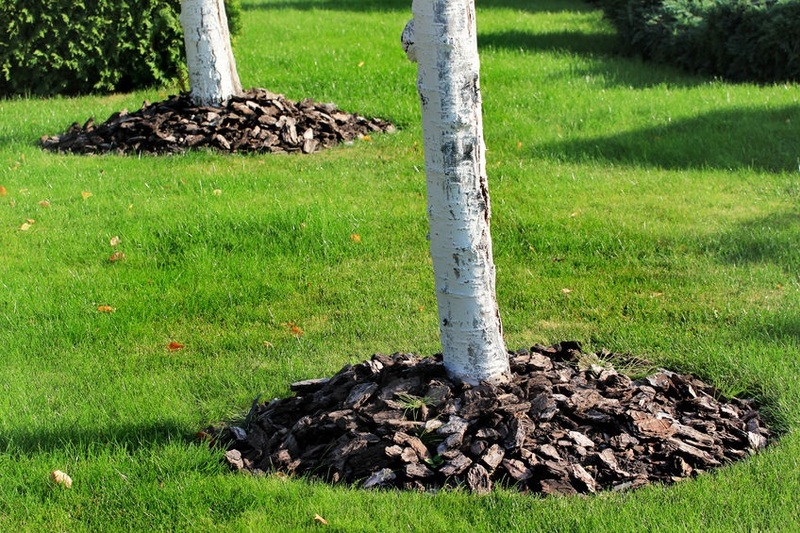 When piled up against the tree trunk, mulch keeps moisture where it shouldn’t be. Moisture trapped on bark makes the tree highly susceptible to disease and decay. Bark may develop cankers, or wounds. Large limbs, leaves, and other parts of the tree above a canker die. Some volcano-induced cankers may girdle an entire tree. Volcano mulching also wreaks havoc on root systems. It causes some roots to suffocate, reducing overall water intake. It also encourages roots to grow up into the mulch layer, instead of down into the soil. During drought years, roots need to tap deep into soil where the moisture is, but if they’re up in the mulch layer they get little but air. Thus, the mulch intended to retain moisture may actually cause the tree may to die of thirst. Additionally, mulch volcanoes shed water like an umbrella. Even in years with lots of rain, an improperly mulched tree may not get moisture where it needs it, because the rain runs off the sides of the volcano. Mulch volcanoes may turn “sour.” This is caused by anaerobic conditions (lacking oxygen) created by thick layers of mulch. The organic material heats up, becomes highly acidic, and smells sour. This acidic mulch burns the tree’s bark. This is especially harmful to young trees that haven’t developed thick bark. Another issue with volcano mulching is the type of mulch used. Not all mulch is created equal. The composition of mulch is very important for plants, because each type of mulch has unique chemistry, water retention properties, and decomposition rates. In nature, this is all taken care of, but a gardener must match the mulch with the need. It’s not clear when the practice of volcano mulching started, but when some landscapers began to do it, others followed suit. Homeowners saw it, and they thought that’s what the pros do, so they copied it. And on and on it spread, like a bad but catchy fashion. If you’re planting a tree this month, be kind to the tree and give it just the amount of mulch it needs. It can live to see many more Earth Days, if given a good start. Call (910) 793-1460 for details! © 2019 American Property Experts. All rights reserved.